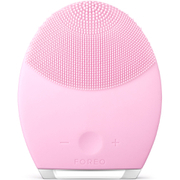 Catering specifically for ultra-sensitive skin, the FOREO LUNA™ brush deeply cleanses skin whilst reducing signs of ageing. Designed with T-Sonic™ technology to thoroughly cleanse by channeling 8,000 transdermal sonic pulsations across the skin’s surface every minute, the device effectively unblocks pores and eliminates dirt, make-up and impurities, revealing a smoother and more refined appearance. Featuring rounded silicone touch-points that glide gently over the face, the non-abrasive LUNA™ resists bacteria build- up and is up to thirty-five times more hygienic than standard brushes. Fully waterproof and easy-to-use, its compact, lightweight design is ideal for travelling and each charge lasts up to 450 uses. With a unique Anti-Ageing Mode that directs lower-frequency pulsations beneath wrinkle-prone areas to help reduce fine lines and crow's feet, the innovative facial cleansing device also works to firm and smoothen your complexion. Skin is left visibly brighter, clearer and healthier. Remove all make-up, then dampen your face and apply your regular cleansing product. Turn on your LUNA™ by pressing the centre button once, activating the Cleansing Mode. Now cleanse one side of the nose by gently gliding the LUNA™ up and down, then change to the other side of the nose. We suggest reducing the LUNA™’s pulsation intensity with the - button before delicately cleansing the under-eye region using outward strokes. After 1 minute, you will feel the pulsations pause 3 times in quick succession. Press the center button once more to put the LUNA™ on Standby, then rinse your face to complete the 1-minute cleansing routine. Please Note: To prevent overuse, the LUNA™ will automatically switch itself off if left for 3 minutes in Cleansing Mode.